Dozens of times a day - I flip open my journal to record some tidbit - this diagram - has an impact on people around me. As soon as they see it - they can't stop themselves from asking "what's that?" I get it - that was my first reaction too. So - here's the scoop on the Chronodex. It's a modified clock-face and was created by Patrick Ng - who has a beautiful blog-post about it which I highly recommend you check out here. Mr. Ng created the chronodex at a time when his father's health was failing and his family was struggling with all that means. He used his art - heavily influenced by his dad's love of art and Chinese heritage - to create something different - a way to track time that wasn't the typical boring vertical list from whatever-o'-clock in the a.m. you wake up until the end of your day. He played around with a few ideas and landed on the chronodex. 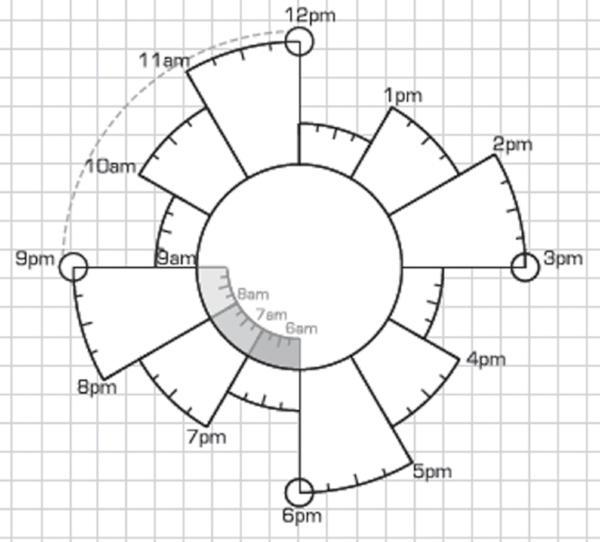 Though Ng is a professional graphic designer in the UK - he impressively generates free downloadable and printable yearly calendars of the chronodex. Here's this years. The generosity of making this visually stunning design so readily available really inspires me. So - there's nothing magical about it - it's just a way to track time - but it is a very different way visually to track time - and as someone who's fairly visual - I really like it. I started using it back when I was still sick to record the various things I was doing to improve my health - and how well those things were working. Later - as I started feeling better - I used it to plan and track my time and attempt to not bite off more than I could chew and cause a relapse. Because I not only like the way it looks - but like drawing it - I trace it daily into my journal and fill it out as I go through my day. I record some of the same and some different things now than I did when I first started using it - but it's become a kind of artsy, meditative point in my day to draw it out. The chronodex has really caught on in some sectors - and has a quite a community on-line. There are articles about it - like this one at LifeHacker. There's a Facebook Page about it (which I just liked) - you can see the page here. If you go there - you'll see that many of the posts/posters use a specific kind of notebook - called a Midori notebook ... which is like a Moleskin notebook - on steroids. Feel free to google image search Midori notebooks - but I'm warning you - that's like journal-crack. You might need a buddy to make sure you don't fall down that rabbit hole forever. Of course - I LOVE journals, and all things journal-crack and so of course I can't not link you to the Chronodex flickr page! You're welcome. Now that I'm freshly inspired - I'm going to play around too - so many cool ideas here! My favorite is the one above - drawn by Mr. Patrick Ng himself - that blends into/turns into a mind-map. Sweet. I don't have to use a Chronodex - but I think it looks cool - and I've been using it for a few years now - and love being able to go back and relive days to a large degree based on my chronodex notes. Mr. Ng is a talented artist with loads of stunning work - drawings, photography and more - I encourage you to take a relaxing stroll through his blog and look at some of the things he's produced. It's visually satisfying. June 01, 2017 /JC's Village C.C.M.